When he has more than two health, Gong San Zan has a bonus -1. When he has two health or less, Gong San Zan has a bonus +1. 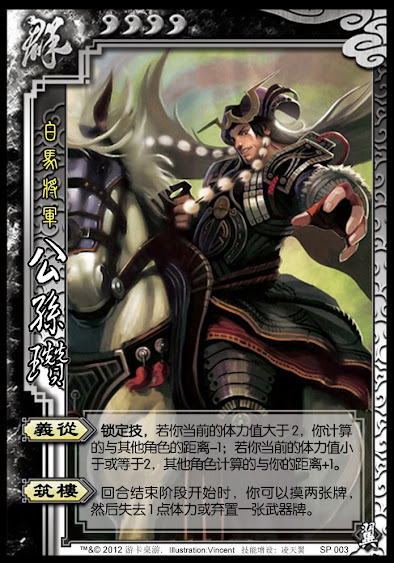 At the end of his turn, Gong San Zan can draw two cards. He then loses one health or discards a weapon. "Follower of Virtue" is the same power that the older Gong Sun Zan possessed. "Follower of Virtue" is not an option. Gong Sun Zan cannot refuse the bonuses. "Fortify" is similar to Huang Gai's "Battered Body". 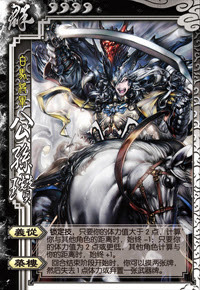 Gong Sun Zan can only use "Fortify" once per turn, but it takes place after his discard phase.